We are pleased to make cakes that are custom, delicious and made specifically for you. Because these cakes are so special – no two cakes are exactly alike causing prices to vary. Pricing is based on the number guest the cake will feed, the complexity of ingredients, the hours to execute the design, the supplies such as bling or characters created and materials. Additional charges may be added to orders made that are due within 7 days-last mimute. A deposit is due upon order confirmation and the balance is due before delivery or pick up. Deposits are nonrefundable but could be used towards a future order if events occur causing cancelation of the cake order. Sculpted cakes typically start around $225 and as stated earlier, prices depend on a wide variety of design elements. 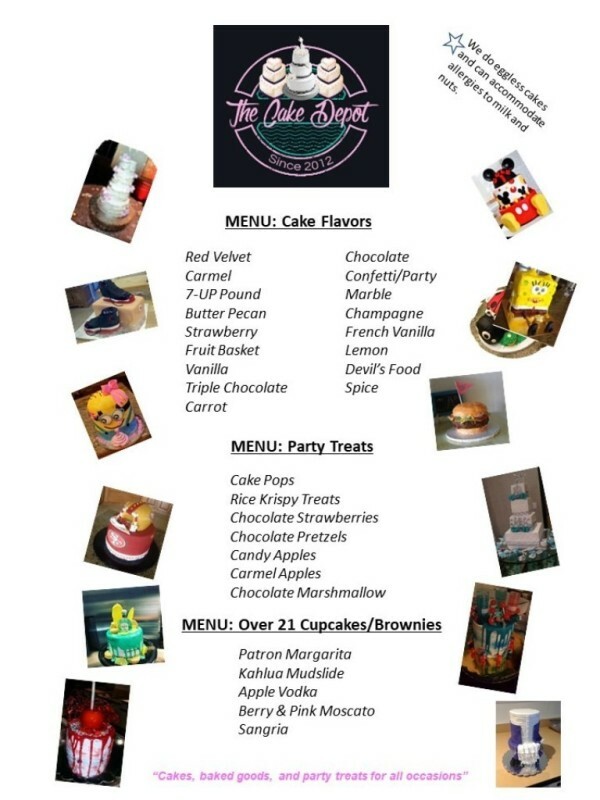 Taste testing cost $25 which will be discounted off the price upon purchase of a cake priced over $250. Wedding cakes start at $6 per slice with additional cost for design and applications. Prices for cupcakes are based on $3 per cupcake for basic cupcakes (cake and frosting) and prices increase with flavor changes, filling, and design changes. Cake pops, marshmallow, chocolate oreo's, and rice crispy treats start at $2 and increase in price as design and ingredients change; pretzels start at $1. Apples start at $5 and also has price increases depending on design.​​ We are experienced in making eggless cakes successfully and will avoid the use of nuts and dairy upon request. There is a delivery charge of $40 dollars if the destinaton location is within 20 miles of the bakery, with an additional $1 charge for each mile beyond 20 miles. There is no set up fee unless prearranged for additional decorations or baked goods. The people you see on TV get a bit more for cakes. Typically setting you back a minimum of $1,000 if it’s sculpted, or about $15 per slice for a stacked wedding cake. We will do our best to deliver exactly what you want for your special occasion working within the budget (a budget that we discuss with you during consultation). We have been very successful matching colors and matching designs but keep in mind that when working with food colors may vary. Also keep in mind serving sizes vary and depending on how cakes are cut will determine the actual number of people the cake will feed. We always provide ample amount of cake according to the details you provide to us.